The Netherlands; Late 15th Century. Latin Text; Bold Angular Gothic Script. In general, the Books of Hours produced for the devout layman in the Netherlands at the end of the 15th century were written in Dutch. This particular example, however, is in Latin. The heavy, angular, and closely spaced vertical strokes, with very short ascenders and descenders, give a much darker tone to the page than to similar scripts in such northern countries as Germany and England. This book hand resembles very closely the types known as lettre de forme which were used by certain anonymous contemporary printers in the Netherlands between 1470 and 1500 A.D. Compared to those of other contemporary Books of Hours, these leaves are somewhat plain. The text is dark black, contrasting nicely with the alternating red and blue initialing and feathery tracery, some of which is in violet. 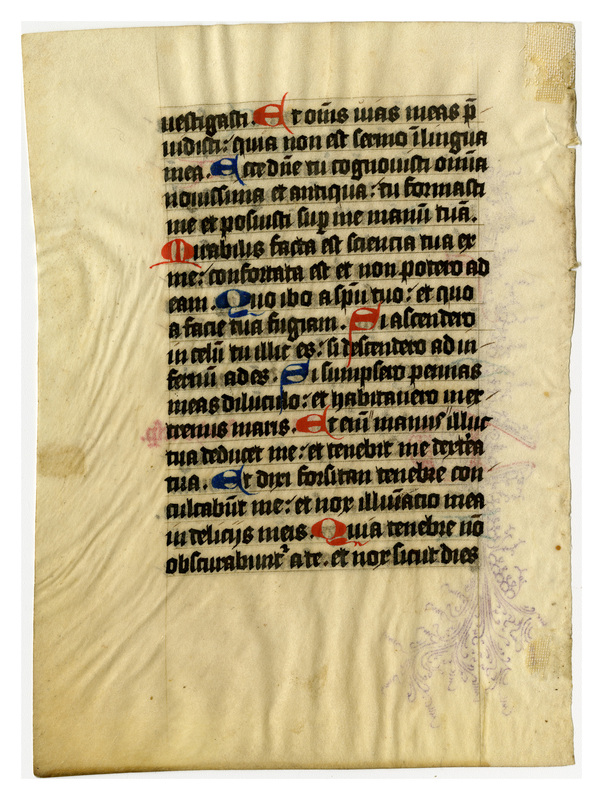 The vellum of several leaves is puckered outside the text block. Text: This leaf contains text from Psalms 137 and 138. Note the rubrication in Middle Dutch on the recto. [Psalms 137:3-8] ...shalt multiply strength in my soul. Let all the Kings of the earth O Lord confess to thee: because they have heard all the words of thy mouth. And let them sing in the ways of our Lord: because great is the glory of our Lord. Because our Lord is high, and he beholdeth low things: and high things he knoweth far off. If I shall walk in the midst of tribulation, thou wilt quicken me: and upon the wrath of mine enemies thou hast extended thy hand, and thy right hand hath saved me. Our Lord will repay for me, O Lord thy mercy is forever: despise not the works of thy hands. The Wednesday vespers. -bis in ánima mea virtútem. Confiteántur tibi, Dómine, omnes reges terræ, quia audiérunt ómnia verba oris tui. Et cantent in viis Dómini, quóniam magna est glória Dómini; quóniam excélsus Dóminus, et humília réspicit, et alta a longe cognóscit. Si ambulávero in médio tribulatiónis, vivificábis me; et super iram inimicórum meórum extendísti manum tuam, et salvum me fecit déxtera tua. Dóminus retríbuet pro me. Dómine, misericórdia tua in sǽculum; ópera mánuum tuárum ne despícias. Des woensdachs vesp. 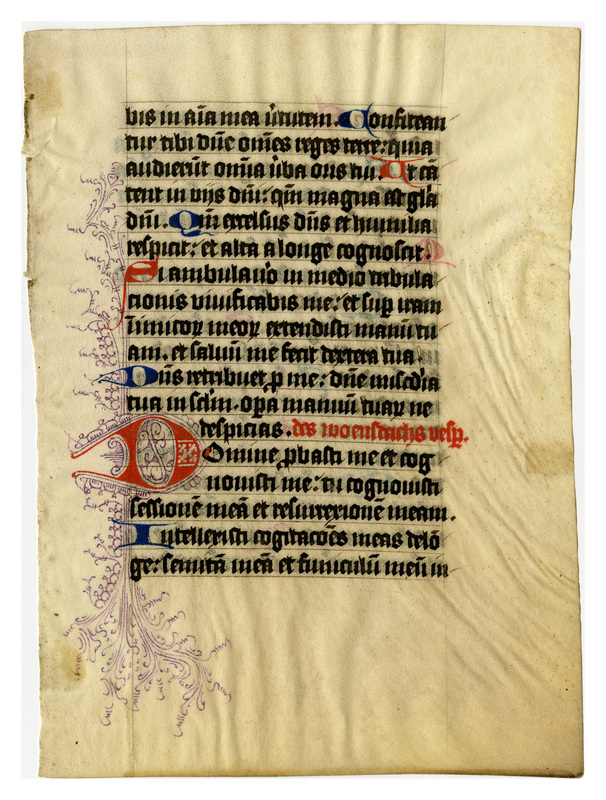 “E0043 Leaf from a Book of Hours (Horæ Beatæ Mariæ Virginis),” Digital Exhibits | Denison University Archives & Special Collections, accessed April 23, 2019, http://exhibits.denisonarchives.org/items/show/63.